Part A – The Wrong Way to ascertain Earth’s surface temperature via The Physics of Radiation. This is sound and well established science and is relied by upon the proponents of Anthropogenic Global Warming (AGW) to explain why they believe the Earth is warmed by human emissions of Greenhouse Gases (GHGs) to a temperature higher than it would be if we were not releasing emissions. 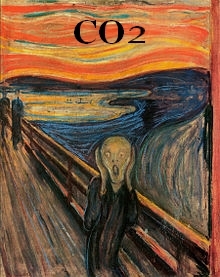 The main concern is emissions of Carbon Dioxide (CO2). The temperature of the Earth is said to be warmer than it ‘should’ be on the basis of the S-B Law. The additional warmth is attributed primarily to CO2 and from that it is assumed that if we add more to the air then the Earth will get hotter. There is also a proposed amplification process from water vapour but that need not concern us here. The S-B Law applies to a planetary body in space without an atmosphere and relies on the planet reaching a thermal equilibrium whereby the amount of energy reaching the planet from the local star is matched by energy leaving that planet to space. At that thermal equilibrium the surface temperature can be calculated using the S-B Law for any planet at a given level of solar input. It is known that a planet with an atmosphere does not have a surface temperature as predicted from the S-B Law, it is always warmer. The AGW theory states that the additional warmth is set by the GHGs in the atmosphere and suggests that other gases make little or no contribution which gives a very large significance to the level of GHGs present in the atmosphere. 2) How has the S-B Law been applied ? Whilst the S-B Law is sound in itself there is scope for misinterpretation as regards the definition of the planetary ‘surface’. Clearly the surface cannot be taken as the ground because there is an atmosphere between the ground and space and the S-B Law does not apply to a planet with an atmosphere. Instead the practice has been adopted of ascertaining what is known as the effective radiating height of the atmosphere and taking that as the surface of the planet for the purposes of the S-B Law. That effective radiating height is the point within the atmosphere where the Earth is emitting radiation to space at the rate predicted by the S-B Law for a planet without an atmosphere. In the case of the Earth that is where the atmospheric temperature is about -18C which occurs at about 4.5 kilometres up from the surface but that is a low level and within the troposphere which is the lowest segment of the atmosphere. There is clearly a lot of atmosphere above the effective radiating height albeit much less dense than the troposphere. In fact the effective radiating height is only about halfway up the troposphere. 3) Why is that wrong? The effective radiating height is simply a median point between the lower part of the atmosphere which is warmer than the S-B Law predicts and the upper part which is colder than the S-B Law predicts. Due to greater density nearer the surface that height is well below the halfway point. Nevertheless the effective radiating height is used as a starting point for back calculating the expected surface temperature from the S-B Law. Applying the adiabatic lapse rate from the effective radiating height to the surface as per the S-B Law then gives a surface temperature which is some 33C higher than it ‘should’ be. Involving the adiabatic lapse rate is an effort to reconcile radiative physics with the Ideal Gas Law but taking the effective radiating height as the appropriate ‘surface’ does not work for reasons that I will discuss in more detail in Parts B and C of this article. AGW theory proposes that the higher temperature at the surface is a consequence of downward radiation from GHGs in the air but in reality it is due to the fact that the entire mass of the atmosphere contributes to the Greenhouse Effect in accordance with the Gas Laws and not just the tiny proportion that is GHGs. Additionally the effective radiating height is not a suitable ‘surface’ for the purposes of the S-B Law. There are too many internal system variables that alter that height independently of radiative interactions. Instead, the appropriate ‘surface ‘should be at the very top of the atmosphere or ideally just outside it. At that height it has been ascertained that solar energy in does match solar energy out and if the surface temperature were to be back calculated from that height then the Earth will be seen to be no warmer than it should be at the surface. 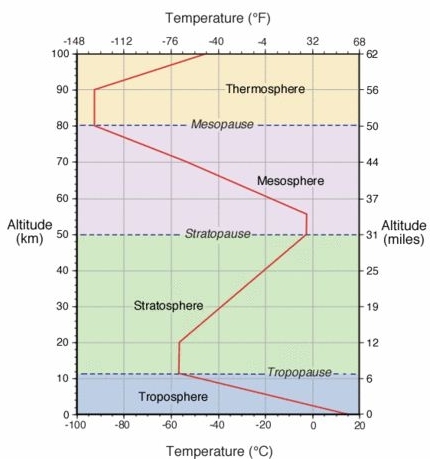 Indeed, one should actually start from the surface temperature, apply the adiabatic lapse rate from surface to top of atmosphere and then that point should be taken as the S-B surface because that will be the point where the confounding influence of the atmosphere ceases to have any significant effect. The top of the atmosphere is very hard to locate because of the slow rate of decreasing molecular density the further up one goes. Applying the S-B Law from surface to the appropriate height would be a sensible way of determining the height of the top of the atmosphere . In contrast, applying the S-B Law from the effective radiating height to the surface in order to determine the ‘proper’ surface temperature is not sensible. Part B- The Right Way to ascertain Earth’s surface temperature via The Gas Laws. 1) Ignore the S-B Law unless it is applied from the top of the atmosphere or just beyond it. The terms used in that equation are described in the article referred to in the link above. 4) That surface temperature will necessarily be different from the temperature obtained from the S-B Law because the S-B Law applies only to planets without atmospheres and the Ideal Gas Law applies specifically to planets with atmospheres. Part C – The Specific Errors arising from the inappropriate use of the S-B Law. It is asserted that it is only the presence of GHGs that enable the surface temperature to be higher than that predicted by the S-B Law. That is wrong. The entire atmosphere including the non GHGs and the liquid water in the oceans contribute to the surface temperature being what it is. That being the case the role of GHGs and in particular the role of human emissions of CO2 is reduced to utter irrelevance. The presence of an atmospheric lapse rate (decline of temperature with height) is discussed. There is no mention of the effect being a product only of the proportion of GHGs in an atmosphere. The temperature of the surface is affected by the mass of every molecule in the atmosphere. That is settled science as per the Ideal Gas Law.ii) It has been established that on Venus the temperature of the atmosphere at any given pressure is the same as that on Earth for the same pressure subject only to an adjustment for distance from the sun. That is despite Venus having around 95% CO2 as compared to about 0.04% on Earth. Clearly the proportion of GHGs in an atmosphere is a complete irrelevance since it is the mass of the entire atmosphere that counts as provided for in the Gas Laws. iii) The thermal capacity of the oceans is vastly greater than that of the air and incoming solar energy penetrates the oceans by up to 200 meters. The sea surface temperature drives the surface air temperature such that if anything happening in the air tries to change the natural equilibrium between sea surface and surface air temperatures (the air temperatures on average are a little cooler) then the air circulation will change to restore the equilibrium. Thus, in the face of the contributions to the Greenhouse Effect of non GHGs and of the oceans, GHGs in the air have a near zero effect in terms of scale. 2) Failing to acknowledge that natural variations in the effective radiating height of the atmosphere occur all the time as a result of the ever changing balance between different non radiative processes within the atmosphere. The so called effective radiating height is not determined by the S-B Law because it is situated within the atmosphere and is therefore influenced by non radiative processes from both above and below. When the ocean cycles change the rate at which they release energy to the air then the effective radiating height will change too. If solar variability changes the chemical composition of the atmosphere above the stratosphere then that will change the effective radiating height. Ozone variations are a likely candidate for that type of interaction. The evidence of the size of climate zone shifts and the associated changes in atmospheric heights from Mediaeval Warm Period to Little Ice Age to date suggests that the natural solar and ocean induced changes in the effective radiating height are far greater than anything that could be achieved by human emissions. In any event the effective radiating height within any planetary atmosphere is set primarily by the properties of the atmosphere and the rate of energy flow through the atmosphere at any given moment and is therefore not a suitable starting point from which to calculate what the temperature of the surface ‘should be’ for the purpose of applying the S-B Law. 3) Failure to realize that the sign of the thermal response to a raised effective radiating height is reversed under the Gas Laws so as to negate any effect on surface temperature. i) The S-B Law requires that a raised effective radiating height results in a higher surface temperature. That results from the volume of the atmosphere being unconstrained other than by gravity so the more energy the sun puts in for a given strength of gravitational field the more the atmosphere will expand upward and the hotter the surface becomes. With no atmosphere the effective radiating height is the surface. The greater the mass of the atmosphere the higher it will rise but as we have seen it is not appropriate to apply the S- B Law from a point within an atmosphere. ii) In the case of the Ideal Gas Law it is the height of an atmosphere of a given mass that determines the number of molecules per unit of volume at the surface and the more molecules per unit of volume the hotter the surface will become at a given level of solar input. It is the Ideal Gas Law which determines the surface temperature for a planet with an atmosphere and not the S-B Law. If GHGs or anything else try to warm the atmosphere without an increase in atmospheric mass / surface pressure then the atmosphere or individual layers within it will expand instead so reducing the number of molecules per unit volume at the surface which, under the Ideal Gas Law, will cool the surface. The warming effect from anything other than increased pressure or higher solar input will be immediately offset by the expansion of the atmosphere reducing molecular density at the surface. Instead of getting an increased surface temperature from more GHGs there will simply be a faster throughput of energy from atmosphere to space. There will be a trivial climate consequence from air circulation changes but miniscule compared to natural variations caused by sun and oceans. Therefore according to the Ideal Gas Law additional GHGs will simply raise the effective radiating height, reduce the density at the surface and result in a net zero change in surface temperature. On that basis AGW theory, in so far as it proposes an increase in surface temperature, is dead. It was all based on a misapplication of the Stephan-Boltzmann Law in place of the Ideal Gas Law.